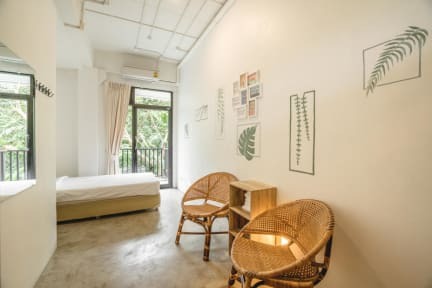 The Dearly Koh Tao Hostel offers young travelers clean, comfortable and affordable shared, and private accommodations. Our exceptional facility is uniquely designed with amenities such common room, rooftop terrace, bar, cafe, and a restaurant. As an eco friendly hostel, taking care of our planet is our top priority and we hope that you share the same values. We believe in exploring and taking on new adventures, discovering the local culture, and having a good time while making new friends along the way. Operated by Thai locals, we know how to make you feel at home. Our hostel is filled with variety of activities bringing us all together. We can't wait to be your friend. All rooms with Air conditioner and Balcony. The building has 5 levels, all rooms are upstairs with stairs access only. Under normal period, cancellations or modifications must be made 2 days (48 hours) prior to the arrival check-in time (14:00) of your arrival date to avoid cancellation fee. If cancellations or modifications made within 2 days prior to arrival date, the first night of the reservation will be charged. Period of 01/07/2019 - 31/08/2019 and 11/04/2020 - 14/04/2020 cancellations or modifications must be made 5 days prior to arrival date to avoid late cancellation fee. If cancellations or modifications made within 5 days but no less than 3 days prior to arrival date, only the first night of the reservation will be charged. If cancellations or modifications made within 3 days prior to arrival date, the total reservation will be charged. It is a fantastic place and I wholeheartedly recommend it! I was in a single room which was super spacious, clean and with a great view. I was travelling alone but I had so much fun as the hostel organised free shuttles to beaches and I met very nice people to hang around with. The staff of the hostel are super friendly and very helpful. The location is perfect - close to cosy restaurants, yoga place, diving studios and a beach of course. It is just the perfect experience! This hostel was perfect! It was very clean and the beds were comfortable. The staff was amazing. They organized social activities and were very helpful. Easily made friends with other travelers staying there. I highly recommend this hostel. Will definitely be staying here again when I visit Koh Tao. So many beautiful things to say about this place. The staff A++ people that also make you feel welcome and at home. I extended my stay here 4 extra nights because of this. Not only do you get breakfast with this accommodation (which is pancakes, toast, fruits, and two Thai dishes usually) with tea and coffee, you also get access to this beautiful pool. A key point I loved about this hostel is that they would set up free trips around the island! Make sure you sign up early! LOVE THE DEARLY. Best hostel I've stayed in ever! Clean, great staff, great people, awesome pool, I really recommend it! Yes, I was hesitating too before booking cause it's a bit off the pist. But just rent a scooter when you arrive on the island (200bhat a day), then you don't have to pay 300bhat for each cab ride. Also, the hostel is offering pick up for 100bhat, I believe. They're offering nice tours ("beach crawls") around the island - for free, didn't see this anywhere else on the island. This hostel was brilliant. Had daily activities and shuttles to the beaches around the island. Staff were awesome at giving recommendations for food and scooter rentals. Met lots of people and enjoyed my time here! Lovely hostel! Delicious free breakfast. Pool was awesome but wished the pool stayed open later. The lounge on the top was an awesome view, but had no chairs or anything to sit on. Would definitely stay again. The Hostel-staff is absolutely helpful and very kind. The bathroom facilities and rooms are very clean and nice to be in as well as the general hostel. Location wise: it’s pretty close to an amazing viewpoint and a beach. You will find a laundry service across the street as well as some restaurants down the street. It might not be right in the center but is therefore quiet. I would definitely come back and recommend it. I've never left a review before but for The Dearly I had to. This is hands down the best hostel I've ever stayed in - more like a luxury resort than a backpacker spot. It's a beautiful place with great facilities, clean rooms and a chilled pool. But the best thing is the staff - they all live on site, speak incredible English and are there to help out, organise whatever you like and will join you for drinks and dinner. Super social atmosphere but not a party hostel. Couldn't recommend enough.